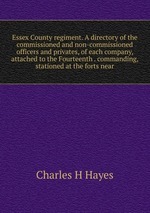 Аннотация к книге "Essex County regiment. A directory of the commissioned and non-commissioned officers and privates, of each company, attached to the Fourteenth . commanding, stationed at the forts near"